We have been running Adventure Training Expeditions and Team Building Corporate Events worldwide for more than 10 years, to countries such as Nepal, Africa, USA, Thailand, Maldives and India. Upon realizing the state of Sabah in Malaysian Borneo is not only a biological melting pot but also a hidden treasure for Adventure, we established a permanent base here and now concentrate most of our activities within this diverse country. Our client base includes, Australian and UK Dive Centers, European companies and Organizations and the British Government. Please browse our News and Events page or Adventure Training photography collection to see some of our previous AT programs, all can be viewed within the page under the link Adventure Training in the right hand sidebar. References from existing clients can be obtained upon request and notes from some of our participants can be perused throughout our Guestbook. For more information about our company, staff and management please view our About Us section. This section of the website is designed for the FIT (Free Independent Traveler), Adventure Training Organizer or Team Building Events and Corporate Travel Manager. Its purpose is to provide information on some of the activities and programs we can provide. 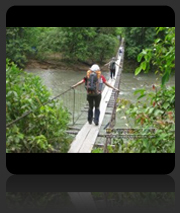 Within Sabah you have access to some of the best hiking, mountain biking, mountain climbing, jungle trekking, wildlife safaris, river and sea kayaking, scuba diving, white water rafting, coastline, tropical islands and ocean anywhere in the world. Using the country’s natural environment and skills of our local staff, we run a wide range of programs, activities and courses for many different people. On each you will find high standards of safety, experienced and well qualified staff and flexibility to your needs and to the conditions. We are activity involved in a number of marine and environmental conservation and awareness initiatives, we include these concepts within our programs. Our Island based PADI 5 Star Dive & Adventure Centre is the perfect location for such events. Here we have a large Dive & Adventure Centre, a large natural training lagoon, direct access to some beautiful coral reefs with all dive sites just minutes away, excellent trekking through primary rainforest and a large grassy area, perfect for camping or playing football and volleyball. Sports such as Scuba Diving, Sea Kayaking, Sailing, Trekking and Snorkeling can be incorporated into the Adventure Training & Team Building Event. We have a fleet of boats, 37ft, 35ft & 32ft all with powerful twin Yamaha Engines 115 – 200 hp. We also use single dingy and yachts for sailing courses and programs. Our Sea Kayaks are Sit on Top and Cockpit style to accommodate different levels. Throughout our programs participants face personal challenges and as a group work together to achieve a common goal, often in alien environments, understanding and camaraderie is key to success. We specialize in bespoke Adventure Training, taking the brief from the client and formulating itineraries to suit group size and duration. Below are some of the main activities that we offer and they can be stand alone programs or combined over a period of days or weeks, extended and reduced to suit. Should you choose, from the moment you or your group arrive in Sabah you are greeted by us. All logistics, meals refreshment and accommodation are taken care of and full equipment provided. Detailed Risk Assessments are prepared for all activities.